My local grocery store had a great sale on pork chops a few weeks ago, so I stocked! 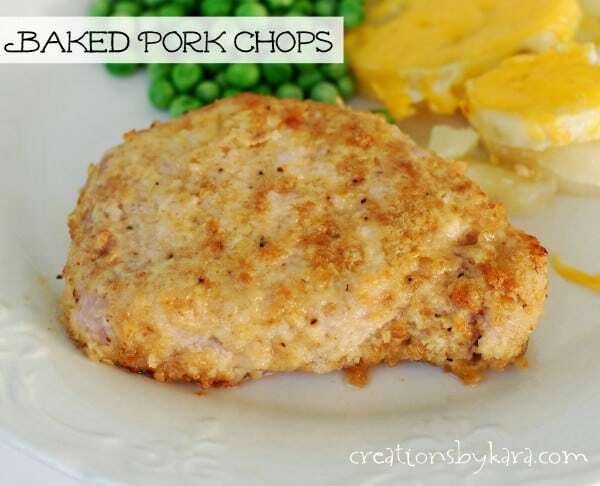 We love my crock pot ranch pork chops, but I have also been experimenting with different pork chop recipes just to switch things up a little. This one is a adapted from a recipe I found at Allrecipes. I don’t like to use a lot of oil in my cooking, so I love that the pork chops are just browned first, then baked. My whole family loved these pork chops! I used Saltine crackers, but I think they would be just as awesome with buttery crackers like Ritz. I recommend lining your baking dish with foil for easy clean up. Who wants to spend time washing dishes? Not me, that’s for sure! Rinse pork chops and pat dry with paper towels. Set aside. Whisk together egg and milk in a shallow container. Combine cracker crumbs, cheese, salt, and pepper in another shallow container. Dip pork chops into egg mixture, then crumbs. Heat olive oil in a skillet on medium high heat. Brown each side of the pork chops for about 4-5 minutes, then place in a baking dish. Bake at 350° for about 30 minutes, or until a meat thermometer reads 145°. For extra crispy pork chops, broil them for about 2 minutes on each side. Don’t over-bake or they will be dry. Would I use a rack to sit the pork chops on while over a baking sheet to Make sure it’s cooked evenly and prevents bottom from getting mushy right? I just want to make sure before so I don’t ruin them lol thanks so much! Yum, Yum! My all-time favorite pork chop recipe. Thanks for sharing. We are making these as we speak. Started out by slapping our forehead because we didn’t get the breadcrumbs, but once I seen this, I got it all together and they are browning up now. Just made these tonight – so good! I used Ritz and they were so flavorful and juicy. Thanks for the tasty recipe! 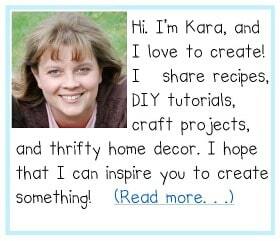 pinned this a while ago but think I’ll be making it tonight! thanks! Wow! Thanks for sharing this recipe! I had all the ingredients already and it was pretty easy to toss the meal together. I love that it’s simple. This recipe is mom, husband, and toddler approved!